One Day (2002) a September 11th story. It is an experimental documentary dealing with the events of the tragedy in New York City. 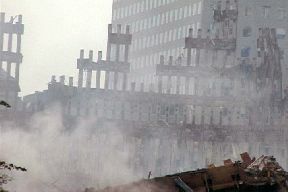 The filmmakers dialogue is about visiting New York City before and after the disaster with footage taken years ago in the World Trade Centre, at the end of September 2001, and in January 2002. One Day portrays two New Yorkers exploring lower Manhattan, seeing the burning ruins, talking about their feelings of the event, and a public memorial by a Navajo spiritual elder. 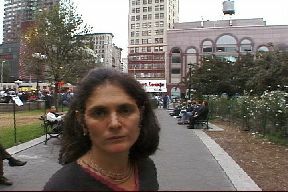 One Day premiered at the Atlantic Film Festival in September, 2002, and was screened at the Montreal International New Media New Cinema Festival (FCMM). It was screened on September 11, 2002 on the Independent Film Channel will been seen on CBC Television Atlantic region.